If Climate Change Is Adversely Effecting Us, How Is This Possible??? Here’s 5 major crop categories. 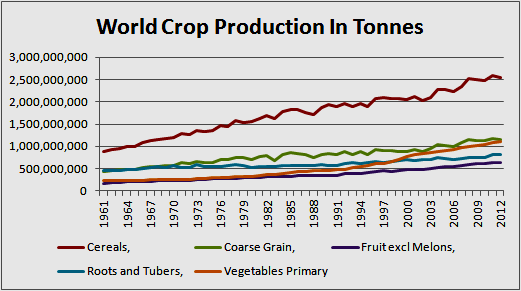 It demonstrates our crop production is greatly increasing, world wide. For those pinheads who make look in an errant direction, here’s the average yield of these various crops. 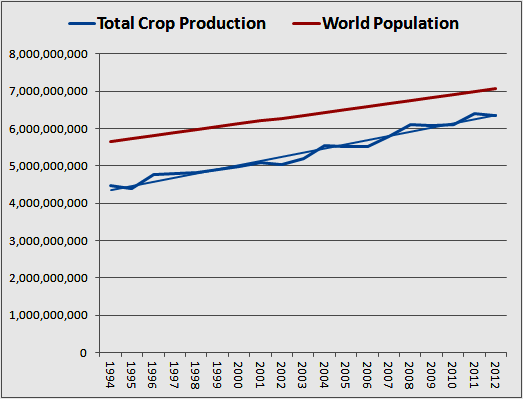 And, for completeness, here is the total crop production with the world population growth over the last 20 years. I even added a trend line so people can easily see that our crop production is increasing at a rate greater than our population! If this is climate change, then we need more of it, not less! 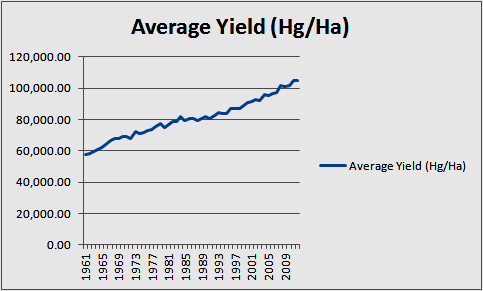 Crop yields and production is up. But, the lunatics would tell us our climate is becoming more inhospitable. 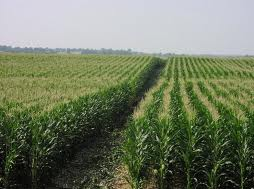 It’s simply not possible to continually increase yields and production if the weather is continually getting worse and worse and more disastrous. Floods and droughts can not be increasing or our yields and production would decrease. One can fertilize plants all they wish, but, they won’t grow in floods or droughts. 7 Responses to If Climate Change Is Adversely Effecting Us, How Is This Possible??? Not bad ….. though still a bit sore from the scraping and whatnot. Yeh, that evil heat is going to jump out of the bottom of the oceans and attack our crops!!!! Appell is trying to extort money over at Judith Curry – claiming of course damages. He neglects the advantages. He is such a bore. Part of me wants to know what happened and part of me wants to avoid being a rubbernecker in the disaster that is DAA’s shilling for a failed cause. You nailed how I feel as well. new dams prevent floods and droughts!! !